Celebrating 200 years of Faith in our Lord Jesus Christ. We're celebrating our wonderful historic church. Join us for the monthly events culminating with our Open House and Banquet, Sept. 20, 2015. March 7 – 2 p.m. recital in memory of Rev. David Hess. March 15 – The Henrietta Historical Society visits at 2 p.m. for presentation on Elizabeth McFarlane Memorial Class. Sept. 20 – Open House/banquet celebration. 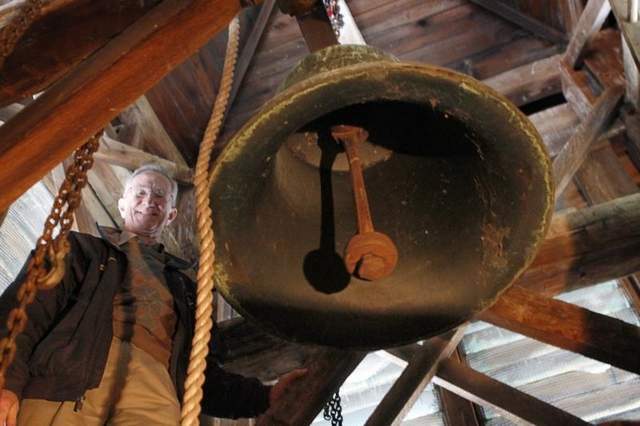 Dec 23, 2012 Pastor David hess ringing the newly re-hung historic church bell at West Henrietta Baptist Church - from an article in the Rochester D&C. Piece by piece throughout this Bicentennial Year, 2015, the history of West Henrietta Baptist Church will unfold in the church's weekly bulletins. Older than the town and older than the county, the church formed in homes and barns as pioneers knit their hearts together and found the friendship and faith to build a community in a wilderness. Within a generation they moved from log cabins to prosperous farmhouses, and their rough block place of worship over by the river was replaced by the classic white clapboard chapel that still stands on the northeast corner of West Henrietta village. Monthly history articles are appearing in The Link newsletter throughout 2015. Presented here is the growing collection of those stories. In 1810, a young man named John Brininstool was the first to settle on the eastern bank of the Genesee River in what would become Henrietta. This pioneer became a member of our earliest congregation and might well have served as prominently as his father and brother did had he not died in 1820. Rev. Thomas Gorton, this church’s first ordained pastor, settled John Brininstool’s estate for his widow and children. Although Michael Brininstool was the father of John Brininstool, Henrietta’s first riverside settler, he arrived here in 1811, a year after John cleared land for a cabin and planted his first small crop. Michael, the church’s only deacon for its first 12 years, appears to have delayed coming until after his own elderly father died. The son of German immigrants, Michael was baptized Lutheran as a child. It is not known if Michael Brininstool arrived here a Baptist or found his Baptist faith living in Henrietta’s deep woods. Josiah Nichols and his son Isaac arrived on the river road in 1811, the same year Michael Brininstool followed his son John to the rich Genesee Valley. Josiah’s home was a frequent meeting place for the Bible study and prayer soon led by Michael Brininstool and a lay preacher called Elder Weaver. It was at Josiah Nichols’ home where Baptists formally organized and called a pastor in February 1815. Like pieces of a puzzle falling into place, key players in the future of West Henrietta Baptist Church continued to arrive in 1811. That April James McNall of Connecticut joined pioneers Michael Brininstool and Josiah and Isaac Nichols. James McNall would die in the War of 1812, but his son James and his descendants would join the Brininstools and Nichols in growing and leading the church for more than a century. Pioneer James McNall, ancestor of all the West Henrietta Baptist McNalls, joined the War of 1812 soon after arriving in Henrietta. Sensing death, he went in place of his namesake son. James did die in the war but just how is a mystery. One legend says he was scalped by Indians outside Fort Erie. Another says he was captured and taken to England where he died in prison. Despite his death, his son James was pressed into military service, but he lived to be memorialized in a stained glass window in the vestibule. February is a time of beginnings for West Henrietta Baptist Church. It was in February 1815 that the congregation first organized in the home of Josiah Nichols. It was February 1838 that West Henrietta Baptists met at the home of Josiah’s son Isaac to plan their separation from United Baptist and the reformation of our church. In February of the 1915 centennial year the church’s old pipe organ was installed. Our first congregation formed slowly. Baptists had been praying and worshiping together under the leadership of Elder Weaver, a lay preacher, for three years before they officially organized in 1815 and called Rev. Thomas Gorton, an ordained minister. Another three years of meeting in homes and barns passed before they built a log cabin house of worship on River Road near Lehigh Station. Other families important to our church history began to arrive between 1815 and 1827 when the church worshiped in a log cabin on the river road. Alvah Remington came alone at 20 in 1817 and built a log cabin before marrying Mercy Gorton, the minister’s daughter. Alvah is memorialized in the stained glass window next to the piano. Among his grandsons were Harvey Remington, a prominent Rochester lawyer and judge who served on the boards of Colgate Rochester Divinity School and Fairport Baptist Home, and Frederic Remington, a well-known Rochester doctor. The stained glass window of early Henrietta settler Alvah Remington hangs next to the window of his son-in-law, William Fenner. William Fenner was born in Henrietta in 1819, the same year Alvah Remington married Mercy Gorton. William would marry their daughter Sarah. Both the Remingtons and Fenners were prosperous early farmers. Lehigh Station Road was called Fenner Road for a time. Four Keyes brothers – twins Solomon and Isaiah and younger brothers Jeremiah and Edward – are known to have come to this area from Connecticut. Born in 1793, the twins arrived sometime before they married in 1821 and 1825. Solomon and Isaiah, stalwarts in United Baptist, supported the church split in 1838. Isaiah, a deacon in United Baptist, continued as a deacon in West Henrietta Baptist. Jeremiah’s line, from which the late Emily Keyes descended, became active in the church later on. Henrietta Historian Tina Thompson believes that Solomon Keyes donated the land on which this church was built. The theory is plausible: As late as 1902, Solomon’s grandson, Warren Sumner Keyes, lived east on Erie Station Road on property that abutted church land. Solomon died the year after the church’s construction. The Searches and Dunns arrived in 1825. Lot Search Jr., father of Lewis and Wesley Search memorialized in stained glass windows on the south side, purchased land from church member Isaac Nichols when he arrived from Bucks County, Pa. William Dunn arrived the same year – also from Bucks County – and married Lot’s daughter Matilda. William Dunn’s window hangs in the northwest corner. Both families were of Scottish descent. Before coming to Henrietta in 1825, Lot Search Jr. had fought in the War of 1812, joining in the defense of Washington during the British attack. He became a leader in Henrietta as well as a life deacon in West Henrietta Baptist Church. The 1827 merger of Baptists on the east and west sides of Henrietta must have been exciting. Negotiations began June 13, 1827 and ended just 17 days later on July 1, 1827. Our congregation was soon worshiping in the new brick church housing the larger, combined congregation and standing not far from the impressive Monroe Academy built the year before in East Henrietta village. As energizing and exciting as the formation of the United Baptist Church must have seemed in 1827, it proved a difficult adjustment. Just two years later, the church nearly split over the handling of a minister’s dismissal. Then, in 1834 and 1835, according to Monroe County Baptist Association records, 40 west-siders were back worshiping in the log cabin. Rev. Thomas Gorton, our minister before 1827, was their leader. That group eventually returned to United Baptist. 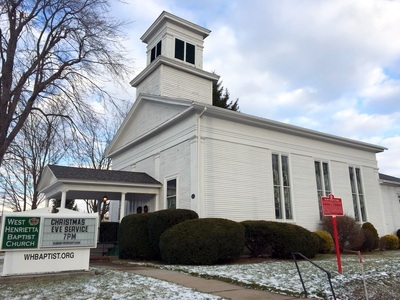 The final split in United Baptist Church of Henrietta came in February 1838 when United Baptist granted dismission or release from membership to more than 70 West Henrietta members. 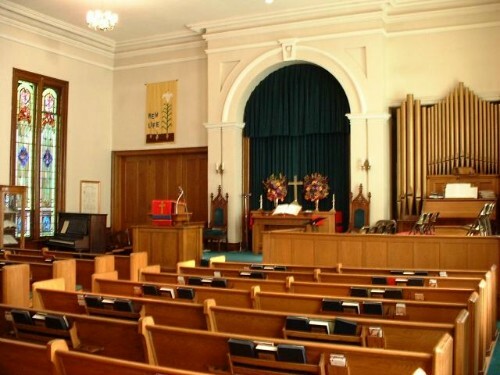 United Baptist only stipulated that the departing congregation raise the funds to build a church. 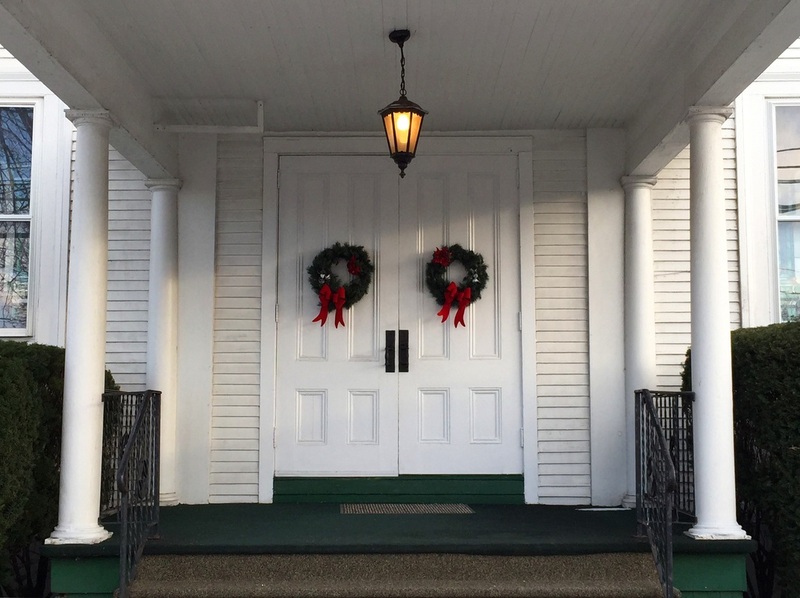 Whatever disagreement spurred the separation, underlying factors were no doubt travel time and the fact that United Baptist was located in the heart of East Henrietta, making the tight-knit riverside members outsiders. The sanctuary was built in the summer of 1838. Henrietta Historian Tina Thompson believes it could have been built by Alexander Williams. Alexander and Joseph Williams were early West Henrietta blacksmiths and cartwrights. Alexander built cobblestone houses and presumably clapboard houses as well. When built, the church had clear pane windows and classic white pews. A small room was attached to the back of the sanctuary. When West Henrietta Baptist Church claimed the northeast corner of West Henrietta in 1838, the other three corners of the hamlet were already occupied by two hotels and a general store. Alexander Williams’ blacksmith and carriage shop, which is now the Moose Lodge, was just to the north on West Henrietta Road. As the church organized in 1838, Isaac F. Nichols, James Murray, Harley Miner, Isaiah Keyes, and Solomon Nichols were appointed a committee to draft the articles of faith and the church covenant. The covenant adopted began, “We do now in the presence of God, angels and men, without any known reserve, devote ourselves to God”. . . . 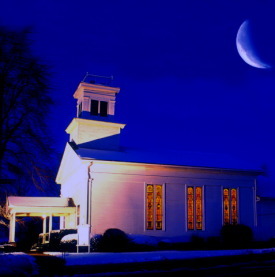 Upon completion of the building of the church in the summer of 1838, a council was called on Sept. 27 to recognize the church as a body of Christ. Six churches participated: First and Second Baptist of Rochester, United Baptist of Henrietta, and churches from Rush, Wheatland, and Pittsford. Three days later, the church was received into the Monroe Baptist Association. Representatives were Rev. Harley Miner, Horatio Corbin, Solomon Keyes, James McNall, and Jacob Brininstool. Rev. Harley Miner was the church’s first pastor in this building. He turned 29 the summer of 1838. Five years earlier, he had buried his wife, Orilla, in Brown Cemetery at the corner of Goodburlet and Pinnacle roads. The church dismissed Pastor Miner in 1841 over a pay dispute. He is found in the 1865 census living in Henrietta as a farmer with a wife, Anna Cole, and three children. In 1880, Harley and Anna lived with their daughter Mary’s family in Goodland, Indiana. His occupation is listed as “retired minister.” Pastor Miner died in Indiana in 1881. Among the changes that occurred after the completion of this building was the 1840 departure of Rev. Thomas Gorton, who had been the church’s first ordained minister in 1815. Having struggled with the United Baptist merger, perhaps he felt his work in West Henrietta finished with the reestablishment of a west side congregation. Sixty-three year old in 1840, he headed to Illinois with many of his family members. He died there at 75. On April 30, 1863, the church gathered in observance of President Abraham Lincoln’s call for a day of fasting, humiliation, and prayer. In September 1878, three men memorialized in the church’s stained glass windows were among those serving as delegates to the Monroe Baptist Association meeting. They were William Fenner, William Dunn, and Albert Keyes. In the first decade of the 20th Century, the church held its dinners in the basement of the new Grange Hall across Erie Station Road. The building now houses the Church of the First Born. The annually meeting on Jan. 6, 1908 was described as a “feast of reason and a flow of soul.” That year the church voted to have weekly offerings instead of subscriptions. They also sent a letter to the governor concerning the Anti-Gambling League. In 1910, Rev. Donald B. MacQueen appointed the church’s first three-member mission committee. MacQueen was the protégée and immediate successor of Rev. John McFarlane, husband of Elizabeth McFarlane, organizer of the class that became known as the Elizabeth McFarlane Memorial Class. MacQueen himself was succeeded by Rev. Frederick Smith, who left to become a missionary in China. In 1936, 29-year-old George Caswell built an oak cabinet to house The Book of Golden Memories purchased that year by Deacon Fred Howlett. The book was to contain the names of the dead for whom contributions were made to the Memorial Endowment Fund. For 57 year this cabinet built by George, who was the grandson of Warren Caswell and great grandson of James McNall, both of whom have windows in the foyer, sat in the sanctuary with its light switched on and its pages turned each Sunday to a different name. In 1993, George’s handmade cabinet was replaced with the curio cabinet to my right. Given by Gladys Smith in memory of her husband Harry, the curio cabinet now contains The Book of Golden Memories and other history books. Today, the original cabinet, retrieved from the basement after 22 years, will become our time capsule. So in effect we are creating a time capsule within a time capsule. We will begin placing items in the cabinet today, but we will not seal it until the end of our bicentennial year. We have time to be thoughtful about our “golden memories” Creating this time capsule gives us an opportunity to reflect on our mortality and on who we are in this 200th year of our church. It invites us to consider future members we will not know. In 50 years, when the capsule is opened, we will all be gone. Voices that sing here, if any still do, will not be ours. Laughter in the Fellowship Hall, if it still stands, will not be ours. But through the time capsule we can encourage those believers we pray will be here. Imagine, for example, if they knew that our Betty Heisig is the granddaughter of a cooper, daughter of a doctor, widow of a Ph.D. research scientist, a nurse, a talented and trained musician, a Keuka College graduate, the mother of four, including an adopted Korean boy, who in her most tragic hour knew that prayer is powerful. She could feel prayers being offered on her behalf. We have many stories of faith, hope and love among us. These are the golden memories we can give the future. We’re collecting the stories in a binder in the Fellowship Hall. Private memories can be sealed in an envelope. Paper and envelopes are located by the time capsule cabinet. Take your time. You will also find 3x5 cards on which to write predictions for our church in 50 years. They should prove amusing. You can also write your prayer for the future on a card. Thank you for participating in the time capsule. It is a dear gift to the future that will inspire laughter, tears, and no doubt some confusion. We should all plan to be witnesses the day they open it. The Fellowship Hall was built in 1920 during the pastorate of Rev. Donald B. MacQueen. The $2,000 needed was raised through subscription. The centennial was celebrated during a two-day celebration held Feb. 24-25, 1915. A new pipe organ was paid for in part with an Andrew Carnegie grant. At the annual meeting in December 1917, it was voted to allow the Ladies Aid Society to elect their own officers. Seven men from West Henrietta Baptist served in World War I. They were Frank Ely, Leland Walker, Arthur Pulver, Charles Nelson, Wilbur Dunn, Allen Pulver, and Carl Abbey. The Rev. James Warner encouraged joining “the war to end all wars” and was himself a captain in the Canadian Expeditionary Force. In January 1925, Pastor W.E. Billingham asked for a raise from $1,250 to $1,560. The motion carried, but by March, the finance committee reported it was behind $750, and the pastor’s salary was returned to $1,250. By September, the church needed a new pastor. The first board of deaconesses was appointed in January 1926. Among the seven women appointed, five were members of the 1911 McFarlane Class pictured in the Fellowship Hall. They were Mrs. W.A. Keyes; Mrs. L.T. Dunn; Miss E. Sherman; Mrs. D.S. McNall; and Mrs. Charles Search. The other two members were Mrs. Kenneth Young and Mrs. Frank Lamberton. On Easter Sunday, April 8, 1928, a special service was held at which time 24 people were baptized by Pastor James D. MacLeod. In 1936,during the Depression, the janitor, Charles Flansburg, had not been paid. When he became very ill, the church Guild voted to take $50 from its treasury for him. The Fellowship Fund gave $25. The Ladies of the Keyes Class gave up a dinner to contribute. Pastor O.E. Myerscough’s Class and the Sunday School each gave $25. From 1934 through 1989 when the Rebecca Circle disbanded, a Ladies Guild was active in the church doing missionary work and fundraising for church needs. Sewing machines at the church were used for White Cross projects. During World War II, gasoline shortages made it difficult for members to get to some functions. Food rations were received by various groupss of the church, so they could continue dinners. In 1944, the church appointed Frank Lamberton, Elizabeth Hall, and Gordon Kipp to serve as a committee to arrange for some form of recognition for the World War II service men and women from West Henrietta Baptist Church. The plaque in the sanctuary containing 39 names is the result of their work. Regina Seel is the one woman named. In 1954, Howard Chase received title to the land behind his store where the church horse sheds had stood. The church had actually sold the land to Dave’s father 20 years earlier. 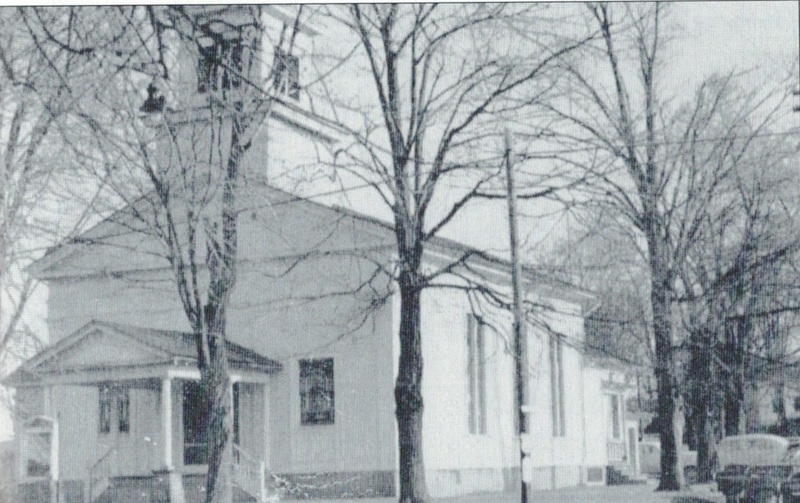 The church's 150th anniversary was held in 1965 during the pastorate of Rev. Charles Bixby. Two hundred were served during a banquet celebration held Oct. 24th in the Fellowship Hall. In 1986, WHBC participated in the "Alive in Mission" program pledging $10,135. The $30 million raised supported new church development at home and 200 foreign missionaries. Rev. Dr. C. David Hess, the church's longest serving pastor, died in office March 7, 2014, less than a month after being diagnosed with lung cancer. Rev. Dr. Jill Bradway became the interim pastor on Sept. 2, 2014 and has served in that capacity to the present time having guided the congregation through its bicentennial year. Contact our Church Historian, Bonnie Healy, if you have any questions: historian@whbaptist.org.